Actress Emily Bett Rickards is joining the cast of the upcoming CW TV series Arrow as a semi-regular character named Felicity Smoak. The character is scheduled to debut in the third episode of the series entitled, “Lone Gunmen”. Felicity Smoak was the manager of a computer software firm in New York City. During one of the numerous metahuman battles that take place in Manhattan, the super-hero known as Firestorm inadvertently magnetized an expensive cache of software programs. This nearly destroyed Felicity’s business and was one of several incidents in which she found herself enraged at the reckless hero. Following one particular confrontation, Firestorm retaliated against Felicity’s accusatory behavior by transforming her clothes into soap suds. As a result, Felicity brought a lawsuit against Firestorm. During this time, Felicity developed a romantic relationship with reporter Ed Raymond. She had no idea that Ed’s son Ronnie comprised one-half of the Firestorm gestalt entity. When Ronald discovered that Felicity was seeing his father, his life became greatly discomforting. Over time, Felicity and Ed fell deeply in love and were married. After her wedding to Ed Raymond, Felicity learned the truth about Ronnie Raymond’s dual identity, but by this point, she had forgiven him for his past transgressions and came to support his career as Firestorm. 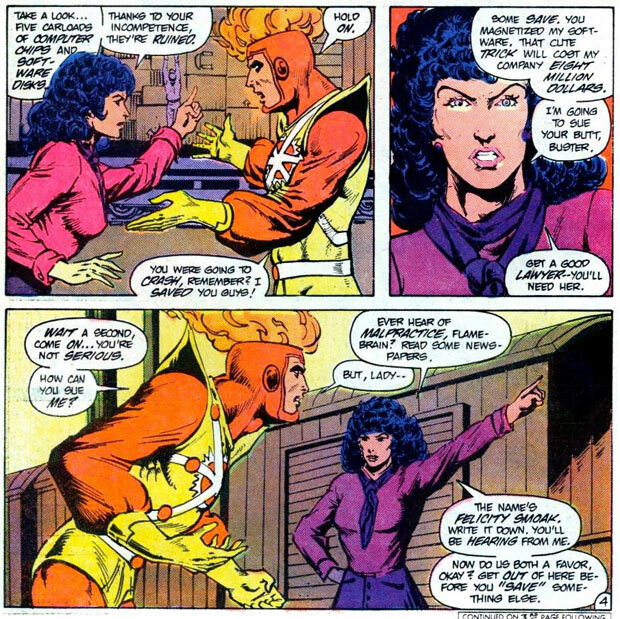 Felicity appeared two more times after the cancellation of Firestorm vol II in 1990. The first appearance was in 2005 when Shadow Thief was put on trial for the murder of Firestorm. The second appearance was also in 2005 when Felicity and Ed Raymond met Jason Rusch in Firestorm vol III #13. Below are a couple photos of Emily Bett Rickards, the beautiful actress scheduled to play Felicity Smoak on Arrow. Adding Felicity Smoak to the cast of characters in Arrow is a bit strange. The character is fairly obscure and has never had a presence in the DC universe outside of Firestorm-related stories. Perhaps the character will serve in some capacity similar to her roles in comics, such as a computer software executive, or filing a legal suit against Arrow for some perceived transgression. Obviously the writers of the show have some reason for picking this particular character, rather than simply making up one of their own. Before we get too excited and hope for Firestorm to appear in Arrow, take into consideration the creators of the show have previously stated no one in Arrow will have super powers. That means no Firestorm in Arrow (insert sad, “awwww”). Now I suppose it’s possible if they’re introducing Felicity Smoak, they might also choose to introduce a young investigative journalist named Ed Raymond. I’m thinking that is the closest we could get to seeing Ronnie Raymond. Below is a news round-up on Emily Bett Rickards as Felicity Smoak being added to Arrow. My thanks to Luke Daab, Keith G. Baker, Andy Kapellusch and Clark Edwards for the heads-up on this news. Regardless what happens with the rest of the Raymond clan on Arrow, we wish Emily Bett Rickards big congratulations on landing this role! Support Firestorm (and Emily Bett Rickards)! Fan the flame! Posted in: Comic books, Firestorm comic vol. II, Ronnie Raymond. I am looking forward to this show. This bit of news… does not impact me one way or the other, although this is a quite strange character choice. It’s nearly as strange as the inclusion of Eric Savin (Coldblood?) in Iron Man 3. As much as I would love to see some version of Firestorm/Ronald Raymond in this series, I am not getting my hopes up. Part of me thinks the executives saw the name “Felicity Smoak” in some “Super-Duper Encyclopedia of Minor DC Characters” and thought the name would appeal to the demographic this show is going to be skewed toward. When a DC employee casually said, “You know, she is part of Firestorm’s history”, I have a feeling the producers of the show said “Firewho?”. For years during Smallvilles 10 year run, I hoped that Ronnie, Prof. Stein or even Jason would turn up. I wanted them to be inspired by Clark, so when he would eventually turn into Firestorm, he would use Clark’s example and become a hero… Sadly it never happened. Im glad to see that WB are continuing to use characters that already exist in DC Universe rather than create new ones. I agree with Leenovak16 that some exec read her name in somewhere and decided to use her for the series. I had the *exact* same thought as Leenovak too. They just thought the name sounded cool.